Kerman or Carmania, the most important city of Iran in southeast and one of important city for its long history and strong cultural heritage. There are plenty of historic mosques and fire temples that belongs to Zoroastrians. In addition to them, Kerman has been mentioned in the list of 1000 cleanest city in the world. Kerman is surrounded by a mountain chain and also desert. Because of this its weathers is variable so that while you may have an experience of warm weather during the day, you will have a very cold nights at the same time. The Bam Citadel with an area of 200 hectares is located on the northeastern part of Bam, at the foot of an enormous rock. It was once the old city of Bam. The old Bam consists of 4 sections and 38 watchtowers. The main materials of the castle were adobe, clay and chaff. It is listed by UNESCO as part of the World Heritage Site: “Bam and its Cultural Landscape”. 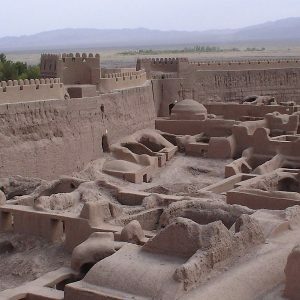 This enormous citadel on the Silk Road was built before 500 BC, and remained in use until 1850 AD. The planning and architecture of the citadel were ingeniously thought out from different points of view. From the present form of the citadel, one can see that the planner(s) had foreseen the entire final form of the building and city from the first steps in the planning process. After the Bam earthquake of December 26, 2003, that destroyed more than 80% of the citadel, several countries are cooperating in its reconstruction. After comprehensive research, the authorities announced that the citadel would be rebuilt. In south of Kerman and on the skirts of mountain Haraz , there is an adobe castle that has a story of Iran’s long history in its heart. It dates back to 1000 years ago and very similar to Bam castle and may be can tell a substitution for it after 2003 earthquake. What has been founded in old documents, says this castle had been a center of trading for valuable goods and textiles due to its location on the trade route. Ganj Ali Khan built this complex during the time he was the governor of Kerman in the 17th century. 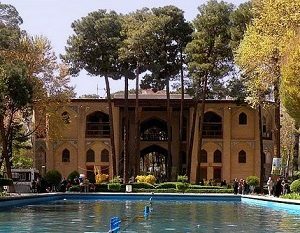 This complex with its beautiful design is a collection of a water reservoir, a bath house, a bazaar, a mosque, a theological school, and also a caravansary. 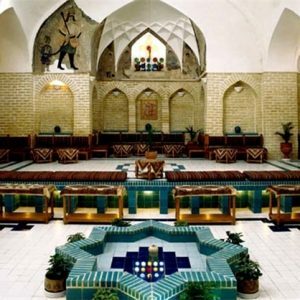 Now, its Bath has been converted to an Anthropological museum of men performing various stages of their ablutions and the Cultural Heritage Organization of Iran preserve it . Both the facade and internal areas display arched tile work which reminds us of the Safavid era. The city of Mahan is located to the southeast of Kerman. 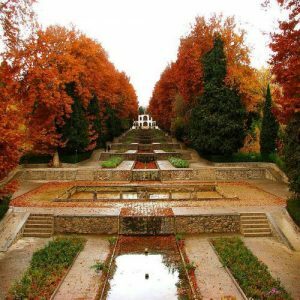 Mahan has a beautiful and large garden with a spectacular structure. It is called Shazdeh Baq. The structure was built during the Qajar era. Various pools were constructed in the garden that are sheltered with fine trees. In 1991, the premises were completely renovated because of the commemoration ceremony of Khaju Kermani, whose tomb is located in Shiraz near the Quran Gate. A traditional guest house has been constructed in the city center for the use of tourists and visitors.